Based out their Muskoka workshop, Living Wood Design was founded by a husband and wife team who share a passion for woodwork and sustainability. In our day and age, it's safe to say that we don't often see where the things we own come from. As consumers, we've become so far removed from the process that most don't really stop to think about the materials that make up the everyday objects in our lives that we use and enjoy. That's one of the motivations that drove Andy Gamper and Anna Smith to create their fantastic works of art. Their approach to their design is very much rooted in their love for nature [no pun intended]. Everything, beginning from the process of sourcing material, revolves around that principal. Living Wood Design uses local reclaimed and salvaged material from fallen trees and broken barns, to make sure that the material doesn't have to travel far, which in turn minimizes their carbon footprint. As with any good design, the designer's passion is translated through their work, and shines through as elements of style. 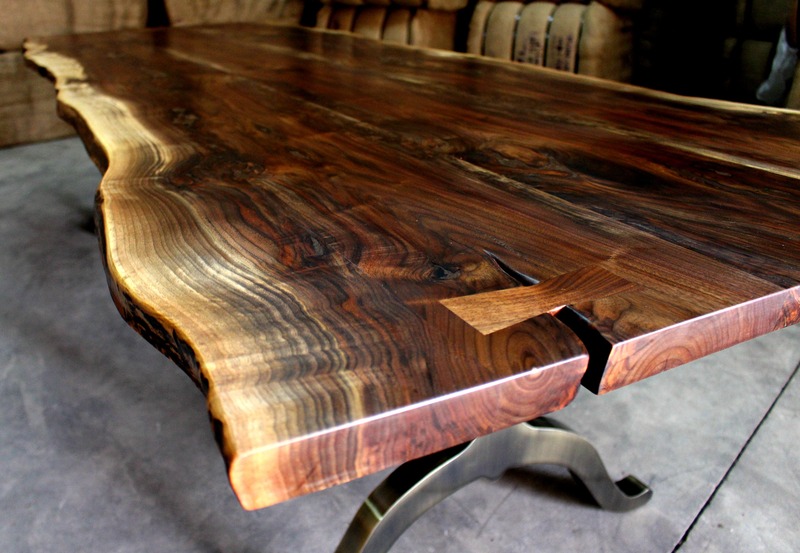 For instance, one of their specialties are live-edge tables. The Living River Table for instance, is made of a beautiful solid slab of locally-sourced maple, with a routed inset for glass, to create the effect of flowing water. The outside edges of the slab were maintained in their natural form, and the glass inlay was formed around it, to preserve the natural shape of the piece. The surface was then sanded at high grit, and finished with pure rubio oil, which has no VOC and is 100% natural. Preserving the natural form and shape of the wood seem to be their mission and they work to preserve the material from which it was made. It reminds me of the wood's natural beauty, and pays homage to the beloved, Canadian wilderness. With that kind of approach to materials comes an ambition to understand it and master its manipulation. It's no surprise that Living Wood Design also dables in handcarving and employs the technique in their furniture. In fact, Andy Gamper was an apprentice of Swiss master carver Siggi Buhler for three years, honing his craft to be able to do bevels and jointery by hand! One word: "Wow!" To learn more about their impressive designs, visit Living Wood Design.